Enjoy an unforgettable VIP experience with official Newmarket Racecourse corporate hospitality. 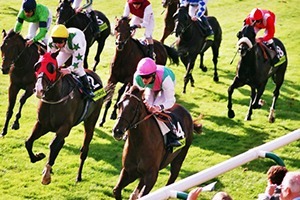 One of Britain’s most historic and iconic racecourses Newmarket is often referred to as the ‘Headquarters of British Horse Racing’ – due to the large number of trainers in the area and its importance to the sport in Britain. Newmarket corporate hospitality packages allow you to experience the biggest meetings of 2019 in luxurious VIP style. There are a wide range of superb hospitality facilities available at Newmarket Racecourse including private boxes in the Millennium Grandstand and the Champions Gallery also situated in the Millennium Grandstand. With prestigious events such as the Newmarket Nights, QIPCO Guineas Festival, July Festival, Cambridgeshire Meeting, Dubai Future Champions Festival and The Final Meeting to relish in 2019, there is ample opportunity to enjoy the very finest corporate hospitality at Newmarket Racecourse. Spring - Apr & May Enjoy one of the some of the finest Newmarket Racedays during the Spring On The Rowley Mile months (April & May). The Spring events offer horse racing fans up and down the country the chance to enjoy thrilling racing combined with excellent hospitality options. Summer - Jun, Jul & Aug During the Summer months (June, July & August) Newmarket host a wide range of meetings including the Newmarket Nights featuring live acts every night, The Moét & Chandon Festival, Summer Saturdays, Summer Meetings and more. Autumn - Sep, Oct & Nov Despite the summer months coming to a close, the Autumn season is very popular at Newmarket Racecourse (September, October and November). A wide range of events take place including The Cesarewitch Trial Day, Cambridgeshire Meeting, The Sun Chariot Day, Dubai Future Champions Festival, Two Year Old Day and the Final Meeting. Newmarket Racecourse is one of the biggest and most popular racing venues in the UK hosting some of flat racing’s biggest events throughout the summer including the 1000 & 2000 Guineas – two of Britain’s five classic races. Newmarket is unique in the sense it actually has two different courses on its grounds. The Rowley Mile Course this is renowned for its 1 mile 2 furlong (2km) long straight – with ‘The Bushes’ and ‘The Dip’ forming crucial parts of the course, making it a unique test of a horses speed and balance. The Rowley Mile at Newmarket Racecourse is used at the beginning and end of the flat season with the 1000 & 2000 Guineas, Cesarewitch Handicap, Dewhurst Stakes and Cambridgeshire Handicap. 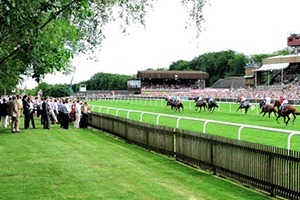 The alternate course at Newmarket is the July Course or Summer Course. The July Course features a 1 mile straight with a stiff uphill finish inside the final furlong. 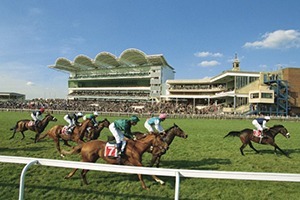 During July it hosts some of Newmarket’s biggest races including the July Cup and Falmouth Stakes. Eventmasters are delighted to offer official Newmarket corporate hospitality packages for the some of the most popular racedays and festivals on the historic Rowley Mile Course. If you are looking to entertain your valued clients and business associates in a luxurious environment then the private boxes available in the Millennium Grandstand and the head on stand can accommodate up to 40 guests and offer a true VIP experience. With champagne receptions, sumptuous fine dining, outstanding views of all the racing action, our private box hospitality options at Newmarket Racecourse certainly offer an unforgettable day for you and your guests. Eventmasters are also delighted to offer the Champions Gallery Restaurant located on the third level of the Millennium Grandstand. This fine dining option offers guests stunning panoramic views of the racecourse – along with one of the finest corporate hospitality experiences at Newmarket.